The Myall Classic is a marathon race held on the NSW Central Coast, starting from the small town of Tea Gardens. It’s often spoken about as the warm-up event to the 111km Hawkesbury Classic, and offers competitors the option of 47km, 27km or 12km courses. 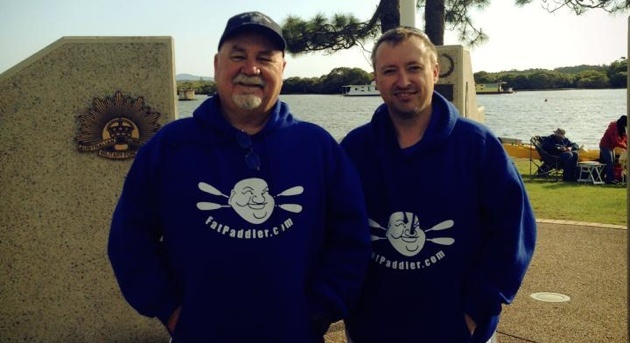 Team Fat Paddler sent up a crew of half a dozen paddlers, only a couple of which had done the race previously. We planned on arriving the night before, catching up over a few beers before turning in for a good night’s sleep prior to the event. Three of us (Grant, Mick and FP) decided to rough it and sleep in swags under the stars. We booked a couple of unpowered sites in a local Hawkes Nest camping park, put up our swags and after a couple of quiet drinks, each settled in for the night. And that should have been the end of it, except just a few hours later the mother of all electrical storms rolled in whilst all three of us huddled in our respective swags, awake and pretty much sh*t-scared. Torrential rain hammered down, howling winds blew, and lighting broke all around us (at one stage, seemingly right in the middle of us all). All three of us got up around 5.30am, each having had no more than three hours sleep at most. Bleary eyed, we each compared our respective experiences – and in particular, the one enormous thunderous strike that made the ground around us shake. Packing our kit, we left the bad memories of the park behind us and rolled up to the start line just in time for sunrise. The town of Tea Gardens wasn’t exactly a heaving breakfast spot at 6am but the early start did afford us the best car parking spots. As the sun rose we unpacked our breakfast camp kits and warmed our hands over the trangia as it boiled water for tea and coffee. It was a magnificent view and importantly the high winds forecasted for the morning seemed to have blown themselves out overnight. The rest of the TFP crew arrived looking well-rested and fresh after staying in local hotels, and were somewhat amused at the dishevelled, quivering looks of the “outdoors three”. Much story telling followed, centering around the fact our swags were under huge gumtrees and next to a steel tray-top ute, pretty much ensuring we were in about as dangerous a spot as you can be in an electrical storm. Paddlers started to arrive more frequently and we all discussed the distance for the day. We’d all signed up for the full 47km but after only 3 hours sleep and knowing we had to drive for 3 hours after the race to get home, we decided 27km might be the safer option. 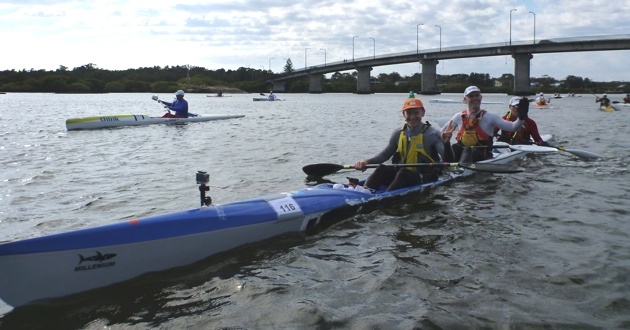 Mick had an even bigger drive (back to Wollongong) so he immediately updated his category, but the feedback from the officials was that it didn’t matter what category we were in, we could decide during the race which distance we would do. As a result the rest of us left ourselves registered in the 47km category – a decision that would come back to haunt us later. By the time the race briefing commenced the fine conditions at sunrise started to change with dark clouds rolling in and the wind again picking up. We debated the clothes we were going to wear, some opting for warmer thermals, others taking the risk of short sleeved summer gear. Then we all pushed out into the murky, muddy waters of the Myall River and lined up for the start. 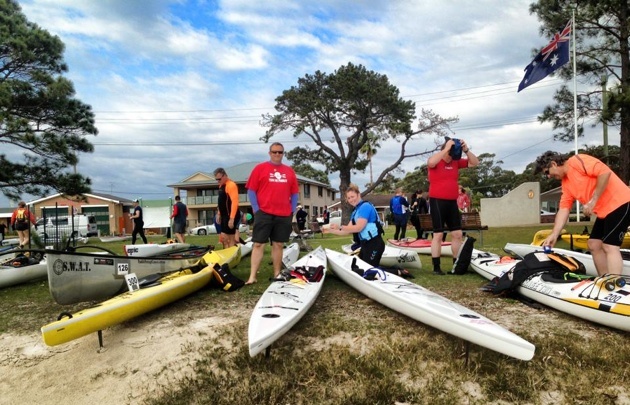 What happens when you cut up and join a single surfski and a double surfski? You get Frankenski! The start was the usual mad rush as the many water craft sprinted off into the headwind. Very quickly we realised however that this was going to be a serious slog, with strong blustery headwinds and a stronger outgoing current slowing our speed down considerably. 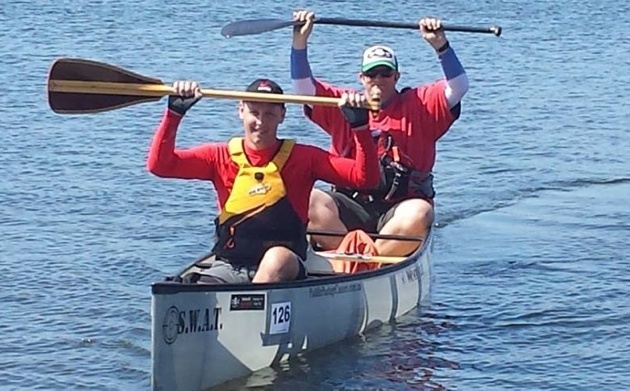 We’d clearly misread the tide information because we were expecting it to be incoming, instead facing a pace in the canoe of no more than 5-6km/hr – no-where near enough to even make the 13.7km marker within the cut-off time for the 47km race. Not that it mattered, since we’d already decided to do the shorter version, but the struggle against the wind in our 19′ sail-like canoe was making steerage a real problem. Finally on the river! The clouds blew away and the hot sun came out. At about 5km the clouds blew off and the sun came out, which was great for those who’d dressed for it, but hell on those of us in winter gear. We made a quick stop so I could get out of all my wet weather gear, but realised then we’d made the stupid mistake of not applying sunscreen…. A mistake that would come back to us later when we discovered the horrendous burns we’d developed. 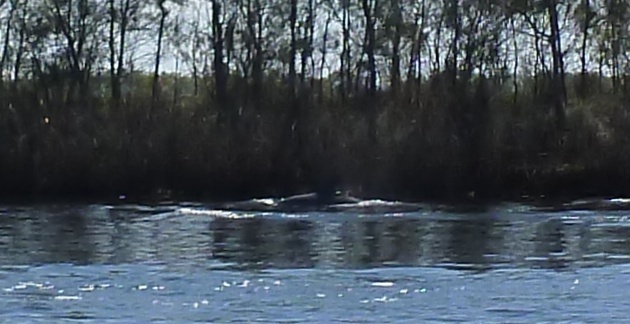 Despite the slog the paddlers were treated to the sight of surfacing dolphins a good 10km upstream, an incredible thing to see so far inland. 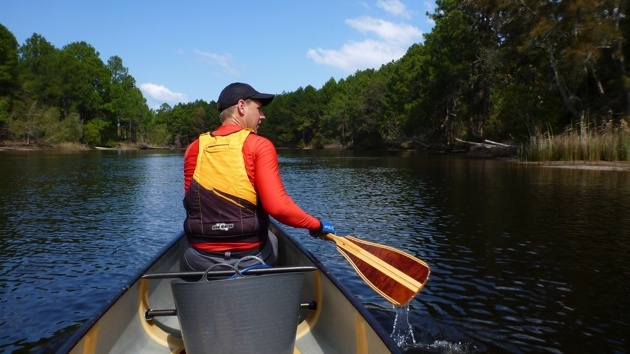 The scenery had also changed from mangroves to pine forrest and sub-tropical palms, and in many ways reminded me of my summertime paddle in Canada’s Algonquin National Park a few years earlier. As we neared the 13.7km turning mark we started seeing quite a few paddlers coming the other way, including TFP’s Grant, Grumm, Dee and friends Lindsay and Tom. 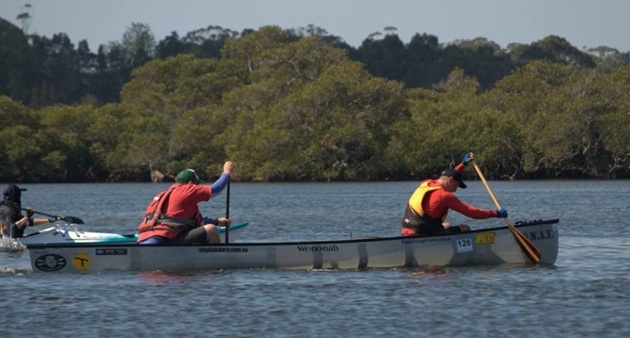 All had decided that the slow pace of the upstream paddle made it necessary to take on the shorter 27km race, and were heading back to the start. We also rounded the marker and, after a quick stop for some food, set off on the return journey. The fact that we’d very nearly doubled our speed on the return leg at least made us feel better. The final 6km or so involved us picking targets and racing to over-take them. The first was a yellow barge-like plastic double kayak that we’d decided we could not accept being beaten by. It was a good 500m ahead of us and making a solid pace, and it took us a good 2km or so to reel it in. Our next target was Grumm, who we knew was struggling and was about another km ahead, so we put in the hard yards to slowly shorten the distance. The only problem was that with 2km to go realised our target had a blue and white kayak and wasn’t Grumm at all, but after chasing it we felt we had no choice than to try and catch it regardless. And so the final km went by as we continued our sprint, catching the kayak with about 50m to go and charging across the finish line just ahead of it (see pic above). After 6km of sprinting it was safe to say I was blown, but my bow-paddler for the day Rob was smiling and had barely drawn a sweat (bloody personal fitness trainers, they’re crazy!!). Still, we eased the canoe into the bank, stepping back out into the black mud before dragging the canoe, and our sorry selves, up onto the grass. And it was there that the rest of our crew told us that we’d all been given DNFs for the race since we’d all done the 27km instead of the registered 47km (with the exception of Meg who went on to win her Female Vet class over the 47km, but who we figured was probably paddling for her club LCRK instead!). 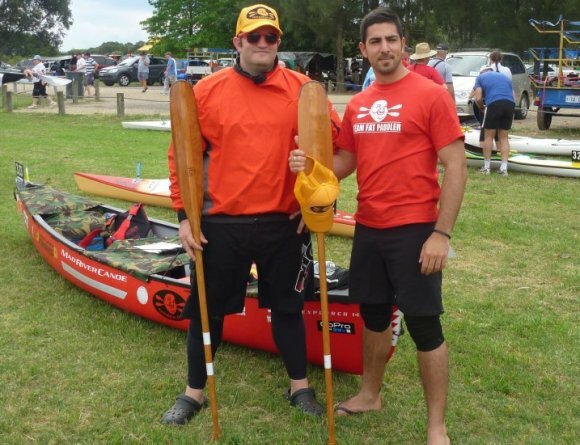 Even poor Mick, who HAD changed his class to 27km, had been driven under a jetty at the start bu another paddler, become tangled in mooring ropes and ended up starting 15mins late before doing the shorter 12km course… and also receiving a DNF. 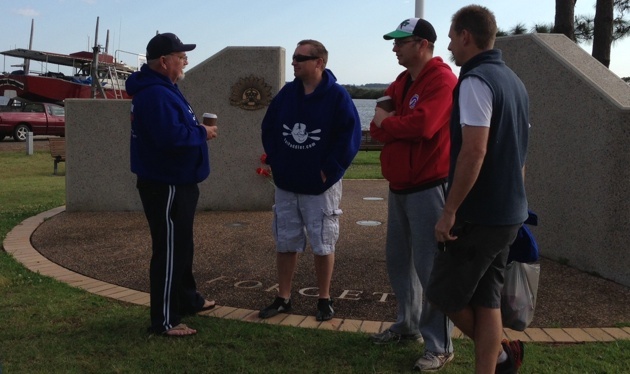 Finally, 27km of hard slog is over… where do we get out?? As a team we were both annoyed and amused at the response that “changing our class after the race was too difficult”, considering we’d been told before the race that the actual distance registered didn’t matter. Still, we’re a team of friends who paddle for fun and not for sheep-stations, and we all agreed that just meeting up, surviving the lightning strikes and getting away together had made the event successful for us. Hey Sean just finished your book from iBookstore. My Dad who is 83 and loves anything boatie and adventure recommended it to me. A great read and full of inspiration. Hope your girls learn to enjoy paddling as much as u do.